It might seem early for the "back to school" report, but if you are in the market to purchase a home and want to be set by the time school starts, you are about out of time. Today's report has a whopping 5 different graphs to show the change in home values by high school zones, middle school zones, and elementary school zones in the Tallahassee real estate market. Additionally, if you are not a subscriber to our real estate newsletter, you missed the high school real estate appreciation report but can check it out here. 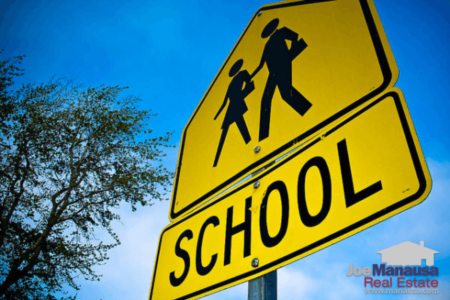 There are five public high school zones within the Tallahassee real estate market, and home values are not responding equivalently across the board. Supply and demand for homes on the West side of Tallahassee is badly out of balance, as is much of the South side. This is reflected in the graph above, as both Godby High School and Rickards High School draw from the segments of the Tallahassee real estate market that have too many homes for sale. The question we should be wondering (asking our school board ....), have the high schools themselves altered the rates of the real estate recovery in Tallahassee? There are nine middle school zones in the Tallahassee real estate market and they too are showing different rates of appreciation. For each (any) middle school zone for which you have an interest, start at the left (2004) and work your way right through 2015. Are values higher today than they were 11 years ago? Take Raa Middle School for example, home values in 2004 were around $106 per square foot, whereas today they have moved higher to $110 per square foot, a 3.8% rise in 11 years. While that "appreciation" might seem low (and it is very low), contrast it with Ft. Braden Middle School which has declined from $117 per square foot to $85 per square foot, a 27% decline in 11 years. By studying these value lines, you can get a feel for where the better values might be found today, or you could even use it as a safety device to buy into the strongest trend (in case you might need to move in the next few years). Regardless how you use it, knowledge is (can be) power for the wise consumer. There are 22 elementary school zones in the Tallahassee real estate market, so we've had to break them down into three separate real estate graphs to keep the information from getting too hard to read. Each of the graphs is set up at the same scale, with values on the left axis ranging from $30 per square foot to up above $160 per square foot. We can see the same type of variance with the elementary schools as we did above with the middle schools and high school zones. Look at the difference in values between homes in the Hawks Rise Elementary School zone and those in the Oak Ridge Elementary School zone! Average home values in the Hawks Rise zone are up 8.5% since 2004, while those found in the Oak Ridge zone have tumbled nearly 50%! The real estate market recovery is not the same in every area, it pays to educate yourself before you make a move. As a reminder, if you missed today's Weekly Special Real Estate Report, you can simply click on the image to the left to get the free one-page .pdf download. It shows 12 years worth of appreciation by each of the 5 public high schools in Tallahassee, as well as the current annual appreciation rate. It is a must have if buying a home today with school aged children. If you have further questions about home sales in Tallahassee not addressed in this report, simply drop me a note and we'll be in touch with you right away.